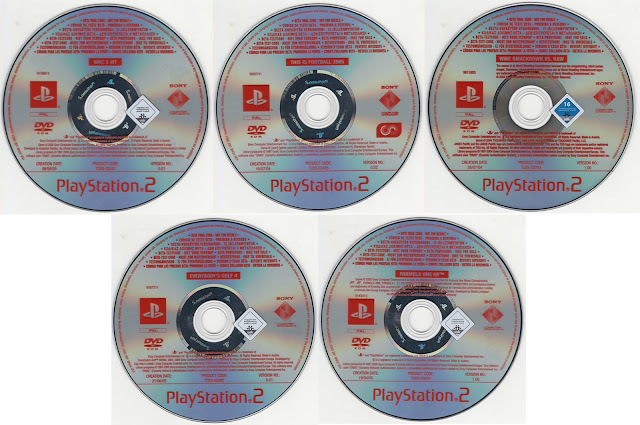 Not so long ago I wrote about snagging some of the PS2 Online Beta Trial discs. Like any hard-to-find unusual looking discs, they tend to sell for a good chunk of change... despite no longer being able to play these discs because of an online requirement. However, I was able to pick up 5 more from the same seller as the first 7 for a pretty fair price, so here they are! Pro Evolution Soccer 5 [TLES-53544] - not pictured, instead an extra copy of WRC 5 WT is posted for some reason. The last one on the list is a new discovery in the series - well previously unknown to me at least. Friend and fellow collector hellomachine shared a playstationage.com link with me with more Online Beta Trial info, which includes an image of a box for the SOCOM release. In addition, hellomachine shared with me a link on the official playstation.com forums with some chit-chat from original members of the Online Beta Trial program. If you have one of these discs - and would be willing to make a perfect disc image for preservation, please reach out to me on the Contact page at the top of this website.